Last week I made the obligatory journey to my stylist's salon and home for our yearly day of dress-up. This time, I had the pleasure of wearing many wigs (as many as four at once) and having white make up caked on my face. But indeed, the results were worth it and I got him to wash my hair afterwards, which is always awesome. 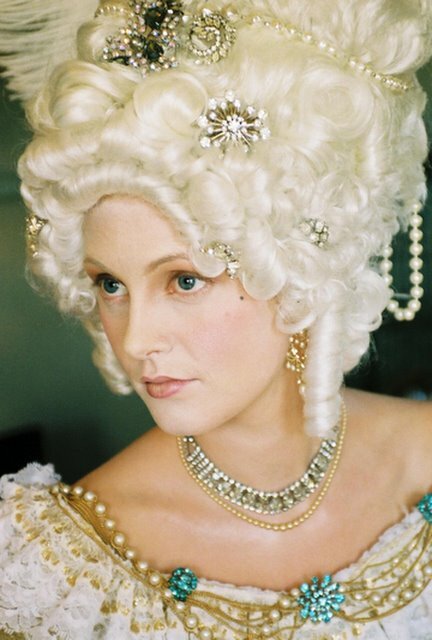 In the first picture I am my stylist's vision of Marie Antoinette, in the second I am the photographer's vision of Marie Antoinette. One somewhat more Hollywood, one perhaps more historical. This is so cool! You're a babe.